Kerala: July 20. Delhi: August 3, 2018. In most ways, Oru Pazhaya Bomb Kadha (An Old Bomb Story) works off a musty template. Two young men who are lifelong friends – check. A pretty heroine whose sole role in the plot is to exist so that the hero can fall in love with her – check. A villain with no redeeming qualities – check. Also in the mix are an unwell father whose treatment the hero must pay for, and regular comedic interludes with zero relevance to the story that are placed there for what formulaic filmmakers consider compulsory comical relief. But then director Shafi threw the entire darned template out of the window and under the stomping feet of a herd of rampaging elephants when he cast Bibin George as the leading man of his film. George is a successful TV comedy writer and artiste in Kerala, and co-writer of the big-screen sleeper hit from 2016, Kattappanayile Rithwik Roshan. What makes him an unconventional choice for a hero is the fact that he was afflicted by polio at the age of one and makes no effort to mask his very visible physical challenge. In that sense, his presence in the film is uplifting and a landmark moment in Indian cinema. 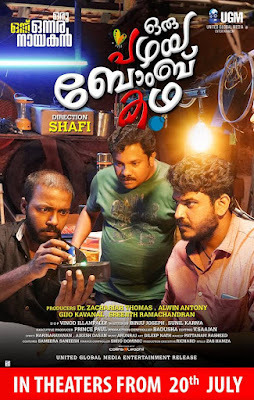 Oru Pazhaya Bomb Kadha is the tale of best buds Sreekuttan (Bibin George) and Bhavyan (Hareesh Perumanna). The two have been crudely nicknamed “one-and-a-half and one-and-a-half” by locals, Sree because he has only one healthy leg, and Bhavyan due to his daily minimum alcohol consumption. Sree has always been keen that his disability should not define him. He has been encouraged in this by his father Mohanan (Indrans). He financially supports his family – consisting of Dad and a sister – by working at an auto mechanic’s shop. Misfortune strikes when Sree and Bhavyan have a run-in with a senior policeman (Kalabhavan Shajon). 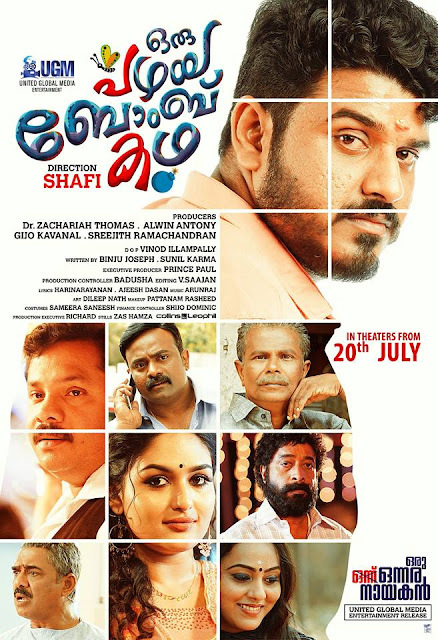 Floating around in the background is Shruthi (Prayaga Martin), a mysterious visitor to their town who attracts Sreekuttan’s attention from the moment he sets eyes on her. The bomb in the title enters the fray late in the day. Bibin George brings a sincerity of purpose, even if not acting brilliance, to the film. And occasionally, Perumanna’s comic timing is well utilised in scenes of unapologetically silly humour. Most important is the fact that Shafi does not use George merely as a source of jokes on the sidelines of the narrative, as filmmakers in the past have done with actors who have disabilities. Sreekuttan is placed firmly at the front and centre of the storyline, and does everything a conventional commercial Indian film hero does – sing, dance, fall in love, fight – which is a good thing at one level, but also what makes Oru Pazhaya Bomb Kadha an assembly-line product that belongs to an era long gone. The title is unwittingly apt. Exemplifying the pazhaya execution of a pazhaya text is the way two recurring motifs are used only to elicit laughs, their contribution to the plot being zilch. First are phone calls from Bhavyan’s grouchy brother-in-law, second is his screechy mother’s constant quarrels with their gangster neighbour. The latter is particularly painfully grating. Both are summoned up every few minutes, apparently in an effort to lighten the mood, though the banshee and the don have the opposite effect. There is no logic to so many of the proceedings, but they are thrown in anyway because they have been a fixture in zillions of films before this one. For instance, Shruthi is kind and looks mortified when her friend makes cruel comments about Sreekuttan one day. Yet, she is later shown apologising to Sree for mean remarks she says she passed. But… but… but she did not... Well, never mind. Because a heroine who emotionally traumatises the hero until she finally acknowledges her love for him is mandatory in formula films, I guess the writers felt driven to weave this senseless scene into the screenplay. That Shafi is a Bollywood fan is evident – boringly so – from the clichéd and repeated references to Hindi films in Oru Pazhaya Bomb Kadha, starting with DDLJ’s Tujhe dekha toh yeh jaana sanam in the background when Sree and Shruthi first meet. Yawn. In the midst of this all-round lack of originality, Vinod Illampally’s quality camerawork and the beautiful singing of Moovandan manchottil kandappa thotte, changil kudungiya pennaana – by Vineeth Sreenivasan for Sree – stand out. The overall standard of cinematography in Mollywood is high, and Illampally is a master craftsperson. He outdoes himself though in this otherwise drab film with a long shot of a solitary Sree brooding on a bridge surrounded by natural splendour and an innovative use of an aerial shot in which Sree and Bhavyan are seen seated on a vast expanse of rock. Illampally’s frames, the milestone that has been crossed with George’s casting as a protagonist and the actor’s conviction alone may have held up the film if it were not for the niggling concern I cannot set aside, that the scenes of violence involving Sreekuttan are somewhat exploitative. Then of course there is the flimsy parallel track about Maoists from Uttarakhand, and the film’s inexorable length. Considering that the plotline does not contain a single molecule of novelty, I cannot think of any reason why Oru Pazhaya Bomb Kadha was stretched to nearly two-and-a-half hours. Yawn.